Death and taxes are typically what most people think they cannot avoid. But people forget federal student loans as well. Since the federal student loans involve the federal government, you are going to be hard pressed to ignore them. 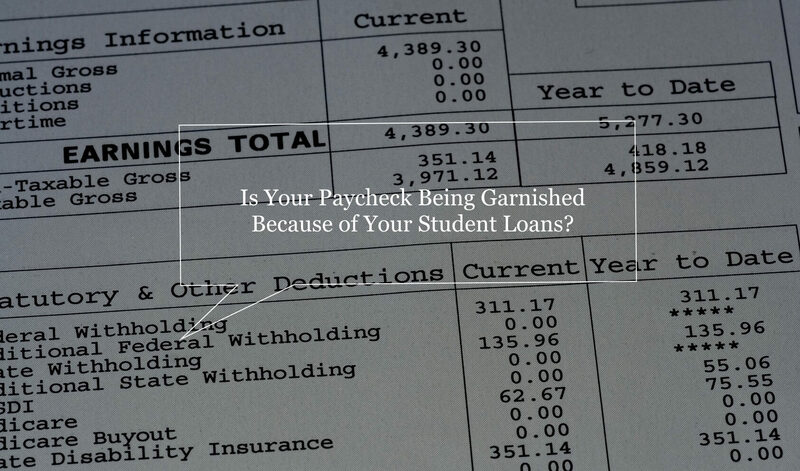 A garnishment can come for different reasons. The first thing you have to understand is that there are federal student loans and private student loans. For a private student loan to garnish someone, they must first sue you in court, get a judgment, then execute the garnishment (usually against a bank account or your paycheck). For a private loan, you have to be served with he lawsuit, then there are multiple steps inside the lawsuit, then garnishment… so it really shouldn’t sneak up on you. Federal student loans are gravely different. They will send a letter to you informing you of the intent to garnish your wages if you don’t start making payments. If you don’t get into a repayment plan, then they are going to send a notice to your employer to start garnishing you. That is it. Basically, straight to garnishment. No lawsuit needed for the government. There is no reason to let that happen to you. It is easier than you think to get out of default and into a rehabilitation to pay back your federal student loans. In most cases, you should be able to pay back based on your income. And in some cases, your payment might be $0.00 per month. Correct, you are “paying back” your federal student loans, but might not even have to send a check each month. I have worked with collection agencies that have defaulted federal student loans placed with them. They have been surprisingly easy to deal with. They are actually looking to place people into affordable payment plans. It does no one any good for you to not be paying your loans back. Some of these agencies will remove the garnishment within a few paychecks. But almost all of them are releasing the garnishment within 5 months. Once you complete the rehabilitation, or when the garnishment is lifted, there are other options as well to get into a permanent repayment plan. We have had a credit card crisis, then a housing crisis already. Don’t let the student loan crisis become an unnecessary crisis for you. Call me at (407) 749-0080 to learn your options with your student loans.